Dr Rasiah is both a Specialist Paediatrician and an Infectious Diseases Specialist. She welcomes the full and diverse spectrum of paediatric medical and developmental problems and enjoys seeing young people of all ages, from newborn to adolescent. 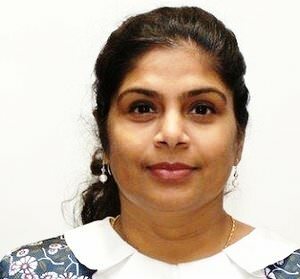 She trained for her Fellowship in General Paediatrics and Infectious Diseases with the Adelaide Women’s and Children’s Hospital and was admitted in to the Royal Australasian College of Physicians, Paediatric Division, in 2012. Before moving to Adelaide with her young family, she attained her initial Fellowship in the UK’s MRCPCH (Member of the Royal College of Paediatrics at Child Health) following training in the UK and some initial training in India. Dr Rasiah is able to consult fluently in English as well as various Indian languages including Hindi, Tamil and Malayalam.